If you’re an old crustacean like me, you might remember the heady days of Tang, the drink of the astronauts. Who cares if it was sugared vitamin water—John Glenn drank it! So did I, and I was often given to flights of fancy. That’s why when I first heard of the Fisher Space Pen in the 70s (a few orbits after their first manufacture), I wanted one. The astronauts used them! And how could one not crave something that used gravity-defeating “thixotropic ink-semisolid …pressurized with nitrogen”? But I didn’t own a Fisher until sometime in the 90s, and slippery little capsule that it was, it disappeared on me. Probably floated off with some pixie dust from a passing comet. What’s prompted these new treasures? Flight from the mainland! My gal pal Alice and I are heading to the Big Island of Hawaii in two days, where we’ll be house-sitting in a little home at the very northern tip of the island. I haven’t done a lot of travel writing lately about new places, so I’m thrilled to get a chance to get to know an island that’s actively spewing hot gases and chunks, like many writers I admire. 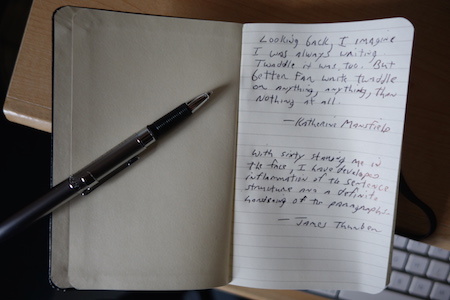 One of those paradoxes: I very much like the physical act of writing, the texture of paper, the angling of the pen (or pencil), the variances of pressure from the hand and fingers, the roll of ink across the page. I love writing instruments, paper, bound volumes, calligraphy. But I have forever loathed the crimped, jagged splotchings of my own handwriting—no matter how slowly or carefully I try to form letters and words, they come out as an intestinal product, something that looks as though it should be covered up. However, I’m delighted to think that I’ll have new promptings of sea, sky and soul to scrawl on about, so I’m looking forward to taking notes of island ventures. And I won’t have to wear any bulky helmet or pressurized suit. OK, off to the island. If I’m lucky, no coconut will drop on my noggin while I’m trying to think of the perfect metaphor for the big, blue Pacific.